Keys Cottage with Beach and Dockage! Bayfront Property! This cottage is tastefully decorated with nautical-style, "beachy" decor and artwork. It has a full-size kitchen with granite countertops, a fenced back yard for pets, and a washer/dryer. Two queen-size bedrooms - each with its own bathroom - make this a comfortable choice for two couples. A sleeper-sofa in the living room allows for up to six guests. Although "Deckhouse" sits somewhat behind our 3 other rentals, there is still a waterview from the outside deck, and it's only a short walk down to the beach! Deckhouse offers all the other amenities of our waterfront property such as gorgeous sunsets, kayaks, paddleboards, fishing pier and free wifi and dockage. This is a comfortable, affordable vacation cottage in which to enjoy your stay in the Keys. As an added bonus, the owners live closeby, and there is staff on site to make sure your vacation goes smoothly. This property is family-owned. 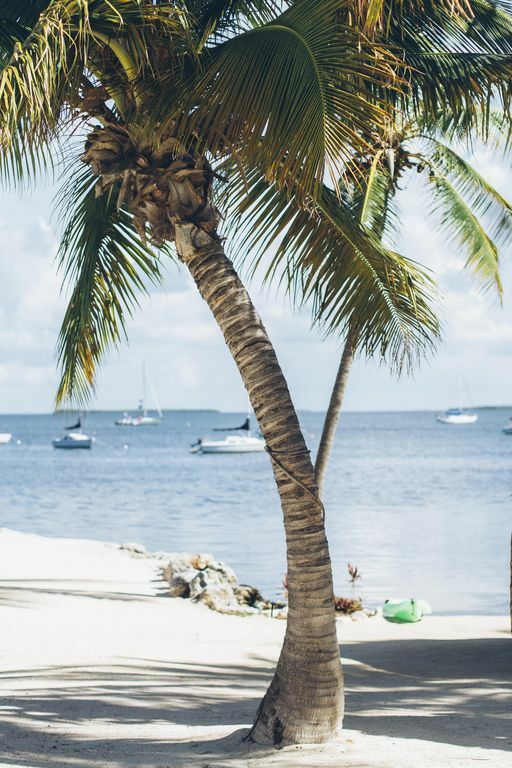 Tanya Cleary and her family live in Key Largo and strive to make Dream Bay a place where guests can relax and return year after year. Spectacular water views from the beach, tikis, fishing pier, free dockage, close to Key Largo's main attractions, and pet-friendly! Cute, affordable 2 bedroom cottage on waterfront property, right on the Gulf of Mexico. Beautiful Keys sunsets! 2 queens, 1 sleeper sofa. Boat dockage/launch also available. Enclosed back yard. Pets welcome. Wireless internet over entire property, even beach. Loved the view from our place and the fantastic beach area with kayak and paddle boards!! Bathrooms at beach were very clean... our place was very clean, kitchen well stocked, great quality towels! Was no extra toilet paper and needed blow dryer!! Great location in Key Largo close to great restaurants! We enjoyed our stay. The property is private and although it is a bit tight between housing, we felt that we had plenty of privacy. The place was extremely clean. The kitchen worked for our needs (breakfast and snacks) and the A/C was COLD. My only somewhat non-100% comment is that the mattresses are very soft and they are noisy - if you are a light sleeper, you will hear each turn over. I would also update the description to note that the step down into the shower is fine but that step out is a doozy. The beach area was very nice and the pier for fishing was enjoyed by the guys as they caught grunt fish and several other fish using shrimp for bait. The tiki hut was a great way to watch the sunsets. We also enjoyed the deck on the front of the Deck House for breakfast and late night cocktails. Perfect for our annual girls' trip! Great location! The Deck House was the perfect size and location for my annual Girlfriends Trip - we're 3 30-something's, and we loved the private tucked away Dream Bay Resort. We did a mix of eating in and eating out - so many great options for both - the grill and outdoor dining set was really nice! We didn't get to light the tiki torches which was the only disappointment. Sabrina was super nice and gave us a quicker route to get into town. She was very available and allowed us to check out later on our departure day since we had later flights. The people around Key Largo and the Dream Bay Resort were very friendly - we absolutely loved it. If you go to Snook's - ask for Chris! He was awesome! We're so happy you had a great girl's getaway at Dream Bay! Come back to see us again! The deckhouse was clean, very comfortable and all we could ask for. We all loved staying there including our dogs! I'm so happy you enjoyed your stay! When I selected this location, it was based on reviews of the location. The mobile unit is clean, simple, comfortable, priced right, but location, location, location was awesome. There were plenty of restaurants and stores nearby to meet your needs. My wife and I had a wonderful time. The location can see both sunrise and sunset, and we nearly saw sunset every night on Kayaks. There were 5 Manatees just outside of the dock area, and they were there everyday. We jumped on our Kayaks, quietly paddled towards them, drifted our Kayaks in that area and literally had them right next to us. I know Manatees are known for the region, but the week that we stayed, we only saw Manatees by our docks, and once other time when we were feeding Tarpons. What a memorable trip. Thank you Tanya! You're welcome! So glad you enjoyed your stay. We do seem to get a lot of manatee visits. Hope to see you back again! Swimming (local community Olympic-size pool nearby), fishing, diving, parasailing, sunbathing, golf (30 min away), eco-tours, swim-with-the-dolphin-programs, sightseeing, shopping, and of course...happy hour at sunset! Golf: Redlands Golf Course and Keys Gate Golf course in Homestead, FL (about 30 mins away). Ocean Reef Club in north Key Largo offers golf to members and member's guests.